"Until now, people have not had the "eyes" necessary to see this particular population of particles. With CRaTER, we just happen to have the right focus to make these discoveries..."
"…compared to neutrons, we know almost nothing about this proton albedo so we're breaking new ground and don't really know what to expect." "This radiation has been fundamental for the formation of life... Darwin said you need two things to make evolution work – natural selection... and some way to give rise to chemical variations in DNA, and that's exactly what cosmic rays provide." 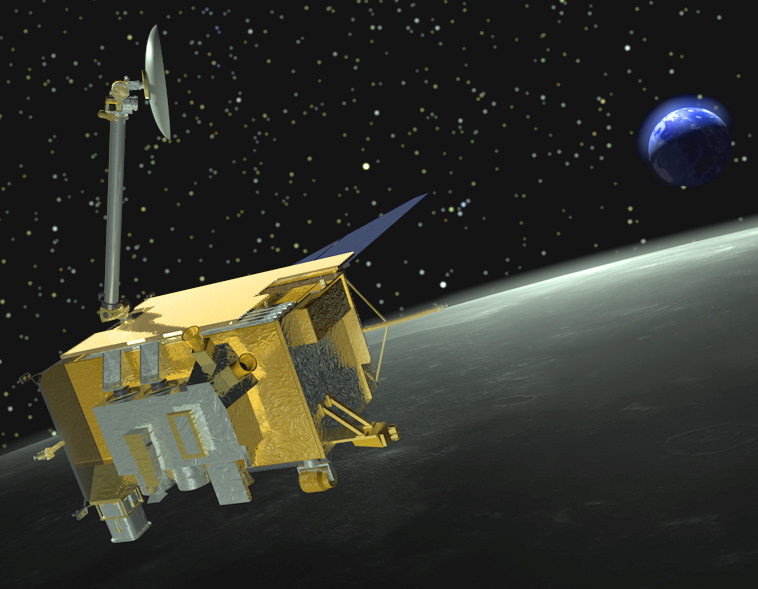 THE LUNAR RECONNAISSANCE ORBITER (LRO) mission was launched in 2009 as a preliminary step towards returning man to the moon. It was a mission of exploration designed to map out possible landing sites and characterize, as never before, the radiation hazards astronauts would encounter as a result of galactic cosmic rays (GCRs) and the other high-energy sources that have been bombarding the moon's surface through the cosmic sweep of time. 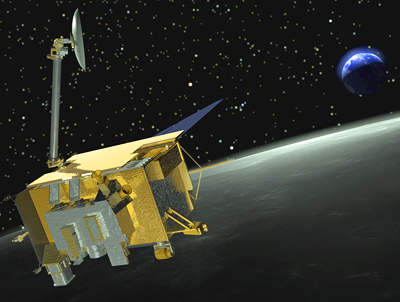 Artist's rendition of the Lunar Reconnaissance Orbiter at the moon. The CRaTER telescope is seen pointing out at the bottom right center of the LRO spacecraft. Illustration by Chris Meaney/NASA. The instrument onboard LRO designed to detect that radiation is the Cosmic Ray Telescope for the Effects of Radiation, or CRaTER, at the heart of which is material called "tissue equivalent plastic" – a stand-in for human muscle capable of gauging radiation dosage. But the mission was still young when it transitioned from one of exploration to planetary science because plans to return astronauts to the moon were shelved, and CRaTER had to likewise switch gears on the fly and reset its sights. It has done so to a fault. "I believe we've really risen to that challenge and have made the transition from exploration to a more geological focus by answering questions about how the moon evolved," says EOS director and CRaTER principal investigator Harlan Spence. "We have made some significant discoveries and have two primary planetary science results that are a substantial part of our current NASA Senior Review proposal." The space agency's de rigueur Senior Review for Operating Missions occurs when a mission's primary objectives have been met and its time is up. The review is to determine if there is value to extending the mission, and the funding to do so. LRO and CRaTER have certainly demonstrated value: in addition to the discoveries in the face of shifting mission objectives, the CRaTER team, as part of the LRO project, has received no less than three Group Achievement Awards in the span of two years from NASA headquarters – an unusual feat (see item in this issue's Faculty, Staff, and Student News). "I think LRO is seen at headquarters as being a highly successful mission," Spence says, "its implementation has been novel, clever, and the way we operate it has been highlighted and the scientific accomplishments have been noted." Indeed, CRaTER's discoveries include two phenomena involving the lunar surface: a "backsplash" of protons that creates a surprising one-two punch of deadly radiation and can also be used to peer below the lunar surface like a geological probe; and surface "space weathering" via GCRs that pummel the moon's soil, or regolith, and cause chemical changes in water ice that lead to the creation of complex carbon chains thought to be pre-biotic structures – the stuff of life. Says Spence, "Until now, people have not had the "eyes" necessary to see this particular population of particles. With CRaTER, we just happen to have the right focus to make these discoveries, and we're now trying to see what we can tease out." One thing successfully teased out of the proton backsplash or "albedo" discovery is a new way to look below the lunar surface that would be impossible without going to the moon and drilling down into the regolith. Albedo generally refers to the optical reflectance of a surface – how much light is reflected back off the body of a planet, a snow or ice field, a forest canopy – but Spence notes that while "lunar proton albedo" has nothing to do with photons of light coming off the lunar surface, the analogy is apt because the protons are "rebounding" to create this backsplash of radiation. The CRaTER team has created the very first map of the moon using these high-energy particles instead of reflected light to show the variation of the proton albedo over the surface of the moon. 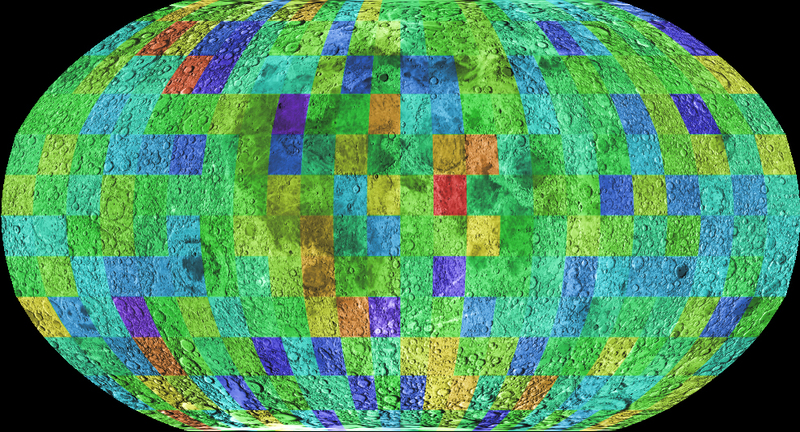 In the map, the superimposed colors represent the varying flux (or rate of flow) of protons off the lunar surface. This albedo map of the moon uses high-energy protons coming off of the moon instead of reflected light to create the image. Different colors represent the flux of protons from the lunar surface, with red indicating the highest fluxes and blue/violet representing the lowest fluxes. The color-coded proton map has been superimposed on a regular visible-light image of the moon. Map by Jody Wilson, UNH-EOS. Space Science Center (SSC) research scientist and CRaTER team member Jody Wilson generated the map based on the instrument’s proton data, which was generated by the following process. When a cosmic ray collides with the nucleus of an atom in the moon's soil, the nucleus is broken up into fragments (protons, neutrons and other particles) that go flying off in all directions – an occurrence known as "nuclear spallation." The fragments, energetic protons, that are thrown up out of the lunar soil and back into space are those detected by CRaTER and used to populate the map. According to Wilson, similar maps of the moon have been made using neutron spallation fragments, and these show regions of contrast due to how the neutrons interact (are absorbed or thrown back) with mineral components in the regolith. For example, after the spallation process occurs in the moon's polar regions, there are slightly fewer neutrons coming back, which suggests the presence of water ice because hydrogen atoms in water slow down the neutrons that are trying to escape. The proton albedo discovery provides a different means of peering beneath the lunar surface in search of minerals, water, etc. But Wilson and Spence both note that CRaTER will need to gather more proton albedo data to derive statistically significant results before that can happen. Says Wilson, "CRaTER is constantly collecting more data and more lunar protons, so the longer the LRO mission continues, the better our sensitivity becomes, and the better chance we have of measuring a real difference in the proton fluxes coming from different lunar regions." He adds, "And compared to neutrons, we know almost nothing about this proton albedo so we're breaking new ground with this study and don't really know what to expect." 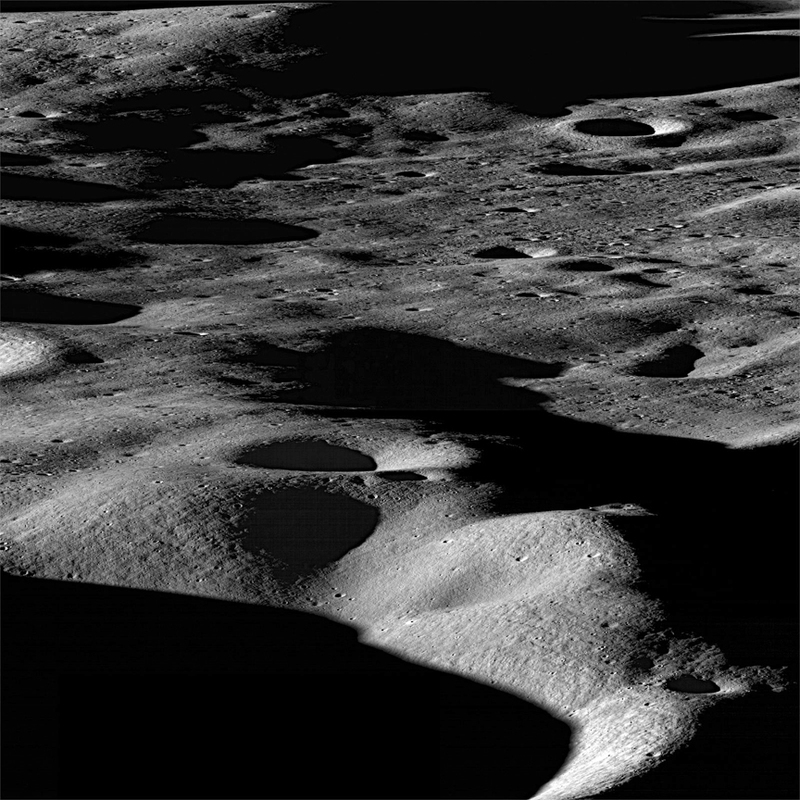 CRaTER's other finding – that the moon's surface is subject to intense "space weathering" from GCR bombardment – not only opens up a new window on how the stuff of life may have come about and evolved but will vastly improve the mathematical models that can, among other things, accurately predict just how bad the radiation environment could be for space exploration. Panoramic lunar view taken by the Lunar Reconnaissance Orbiter Camera of the north rim of Cabeus crater. The distance from left to right is about 75 kilometers (46 miles). Cabeus crater is relatively old and contains areas of permanent shadow. Such regions are of great interest because they may harbor significant deposits of ices (water, methane, etc). Image courtesy of NASA/GSFC/Arizona State Univ. In a paper just published in American Geophysical Union's Journal of Geophysical Research (JGR), lead author and CRaTER team member Nathan Schwadron of the SSC notes that the space weathering discovery was related to CRaTER being able to measure the highest levels of GCRs ever observed since the space age began due to an unusually calm and quiet Sun. During this quiescent period, the diminished power, pressure, flux and magnetic flux of the solar wind allows GCRs and solar energetic particles (SEPs) to more readily interact with objects they encounter. Notes Schwadron, "This has provided us with a unique opportunity because we've never made these types of measurements before over an extended period of time, which means we've never been able to validate our models. Now we can put this whole modeling field on more solid footing and project GCR dose rates from the present period back through time when different interplanetary conditions prevailed." The models can now be used more effectively to predict potential radiation hazards spawned by GCRs and SEPs. Says Schwadron, "Our validated models will be able answer the question of how bad the space environment is and how bad it will be during these high-energy radiation events, and the ability to do this is absolutely necessary for any manned space exploration beyond low-Earth orbit." Indeed, current models were in agreement with recent radiation dose rates measured by CRaTER during the period of high GCRs and low solar activity, which demonstrates the accuracy of the Earth-Moon-Mars Radiation Environment Module (EMMREM) being developed at UNH. EMMREM integrates other models describing time-dependent radiation exposure in the Earth-moon-Mars and interplanetary space environments and has now been validated to show its suitability for real-time space weather prediction. CRaTER's recent findings also provide further insight into the double-edge sword of cosmic radiation. That is, while it does pose great risks to astronauts and even spacecraft, it has been an essential ingredient in the formation and evolution of life on Earth and, perhaps, elsewhere in the universe. "This radiation has been fundamental for the formation of life," Schwadron notes. "Darwin said you need two things to make evolution work – natural selection, a process where life gets weeded out or promoted, and, two, a source of genetic variation. You need some way to give rise to chemical variations in DNA, and that's exactly what cosmic rays provide."